Rihm belongs to Karlsruhe. He was born and raised here, he sang in the city’s choirs, played the church organs, and now teaches at the conservatoire. The flat where he lives is a stone’s throw from his first family home. 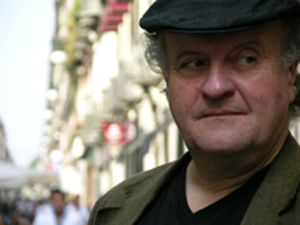 Since he composed his St Luke Passion for Stuttgart 10 years ago, choral works seem to have figured more and more prominently in Wolfgang Rihm’s output. RIHM EDITION VOL 4: QUID EST DEUS on Hänssler includes one of the most substantial of them, the “cantata hermetica”, Quid Est Deus, composed in 2007. It sets 24 Latin definitions of God as a series of choral statements, often with minimal orchestral accompaniment. 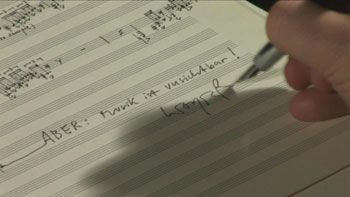 There’s an austere, hieratic quality about the writing, and a Stravinsky-like feel to some of the harmony (deliberately or not, a recurring progression almost directly quotes from the Symphony of Psalms), though the orchestral outbursts that ­occasionally punctuate the sequence have a highly wrought expressionist edge. It’s a compellingly concentrated piece, very different from the sparer, earlier works on the disc, which belong to the period in the late 1980s and early 90s when Rihm was influenced by Luigi Nono’s late works. These use spatial ­effects, dispersing the orchestra around the ­performing space: Ungemaltes Bild ­(Unpainted Picture) attempts to convey in sound the spirit of a watercolour ­series by Nolde, while Frau/Stimme sets a Heiner Müller text for two sopranos, embedding it in fractured, halting ­orchestral textures from which it emerges piecemeal. The first half of this Volume Four in Hanssler’s Rihm Edition series is the new choral work “Quid est Deus fur Chor und Orchester” (2007), commissioned by the University of Freiburg for its 550th anniversary. Rihm uses as the libretto an ancient text attributed to Hermes Trismegistos which presents the answers of 24 philosophers to the question ‘what is God?’ The 24 theories take the form of short definitions. Sylvain Cambreling leads the SWR Vokalensemble Stuttgart and the SWR Sinfonieorchester Baden-Baden und Freiburg in the performance, recorded in November 2007. According to Rihm, “The vocal parts are devoid of all the typical features of contemporary choral practice, but are nonetheless very demanding — especially in the areas of intonation and articulation.” So the text is not fragmented, and is sung without any experimental vocal techniques.